This Sale Swooper Flag is Ready to Ship! These Message Banners are Certain to Attract Attention from Customers! This Sale Swooper Flag is in Stock Now! Pre printed single side dyed through with mirror image on backside for a highly visible display. Metal ground spike for a durable and reusable installation. 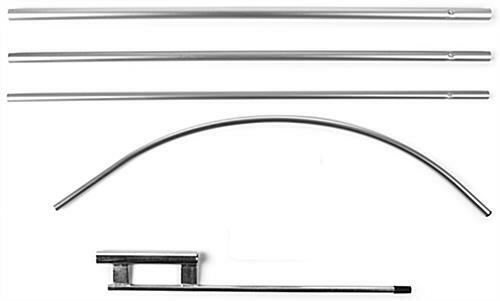 Economy pre-shaped aluminum pole is portable and inexpensive. 14' Height with bold red text on a yellow background for easy to read signage. 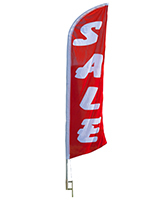 This sale swooper flag that consists of a 4 piece aluminum pole is light weight and moveable. This display has a feather shaped pennant which is meant to ceaselessly stay open and not curve inwards even in the wind! 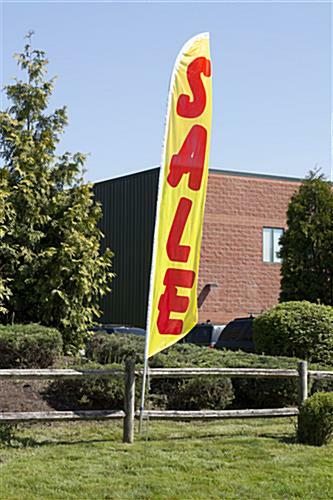 This yellow and red sale swooper flag, also known as a message banner, stands 14 feet tall to demand attention from customers. This outdoor signage waves in the wind to entice customers whether passing by in a car or on foot. 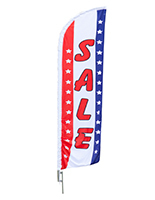 This sale swooper flag is 27" wide by 142-1/2" tall for a larger than life sign. 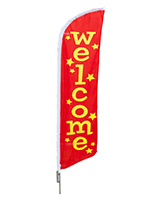 This banner is made with a poly knit fabric and boasts brightly printed colors. 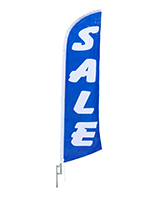 This sale swooper flag will alert customers of special promotions going on in an establishment! This display is ideal for businesses with property to place a ground spike. 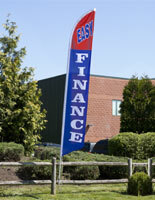 This sale swooper flag includes the metal ground spike which can be reused due to the durability. 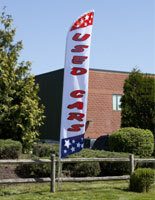 This sale swooper flag that is affordable is an economical alternative to custom designed message banners. This signage is more affordable than comparative message banners due to the aluminum pole. 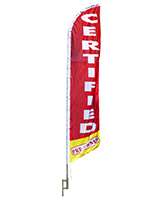 This sale swooper flag has a pole that does not bow in the wind, and therefore cheaper than fiberglass poles but also more portable. In addition, aluminum has a tendency to weather after long use in comparison to fiberglass poles. 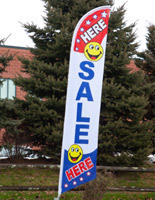 This wind fluttering banner, sale swooper flag that uses a ground spike is simple to install and can be reused in different locations.